If you would like to consider investing in an original Eric Wilson Painting please browse the list below of currently available paintings. This list will change over time as paintings are sold and new work is created. I can ship paintings worldwide and as you are buying directly from the Artist you can rest assured that you will be getting the best possible price without any middle man and that everything will be handled professionally and without delay. I am always happy to consider painting something special just for you. If you would like to consider commissioning me for any subject, please contact me using the contact form and we can take things from there. Edge Of Darkness. - White Wolf in Pastel. Available. Pastel 19 x 16 inches. Namibian Elephant. Oil on linen 12 x 10 inches. Colours of Rajasthan. Pastel. 19 x 23 Inches. Polar Bear Cub at Wapusk. Commander Dave Scott, Apollo 15, salutes the flag at Hadley base at the end of EVA 2 on 1st August 1971. He is the 7th man to walk on the moon and the first man to drive a car on it. Silver Spur and Mount Hadley Delta can be seen in the distance. Oil painting on canvas, 48 x 36 inches. The original photograph, from which I based this painting, was taken in black and white by Jim Irwin. It was a much larger scene which included the lunar Module. I concentrated upon the figure of Dave Scott for my painting, adding the colour and missing detail from the grainy black and white image, making this image unique in that it is exactly as it was on the moon, and yet improving upon the original image to give us a better appreciation of that magnificent moment. Namibian Giraffe. Coloured pencil. 18 x 24 inches. Original Painting of a Giraffe. For Sale. Interested in purchasing this painting? Please contact me for details. This is actually a coloured pencil drawing on paper. It's the first time I ever used coloured pencil and I have to say I really enjoyed the vibrant colours which were perfect for the rich warm glowing colous you see as the sun begins to fall in Namibia. I was lucky enough to teach art in Thailand and it was a great pleasure to take some time out to visit the absolutely spectacular Khao Sok rainforest. Home to clouded leopard and of course the magnificent Great Hornbills that I have shown here. This is the largest pastel painting I have yet done. This original rainforest painting is available for sale. 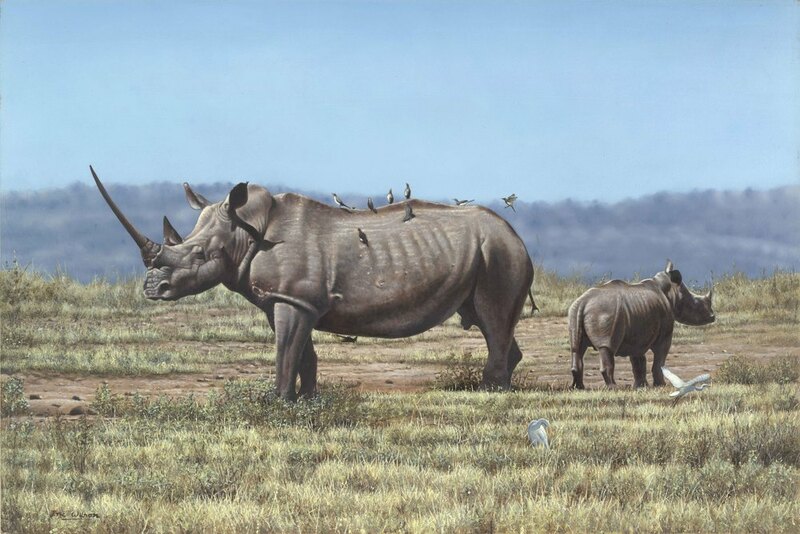 This painting is on the cover of a book titled 'Resurrection science' which is all about saving species from extinction. Polar Bear mother and cubs. I have been fortunate enough to spend time up in the far North with Polar Bears. I will never forget the cold and how perfectly adapted to it the bears were. The title of this huge painting expresses my concern for them as the polar regions warm up. Apollo 17 Astronauts Gene Cernan and Harrison Schmitt at Taurus Littrow on the Moon. A non wildlife painting for a change. I have always had a fascination for the Apollo space missions. Here I have imagined myself at Taurus Littrow, able to see both Astronauts together on the surface.